The KERA FM January membership drive contest starts Jan. 7, 2019! See details about the prizes and how to enter the contest, along with official contest rules below. Includes parking and access to the Members Lounge w/ Complimentary light bites, red, white, sparkling wine, soft drinks and water. Fair market value: $2,400. DRAWING DEADLINE: Thursday, 1/10/19 at 8pm.
? Michael Bublé tickets – Four floor seats in section 10 on the runway for the performance at the American Airlines Center, on Monday, March 25, 2019 at 8pm.
? Fair market value: $4,000. DRAWING DEADLINE: Friday, 1/11/19 at 8pm.
? Hill Country Getaway — A 3-night stay in a King Suite at Crystal River Boutique Hotel in San Marcos. Prize includes a bottle of wine and 90 minute massage for two. Winner also receives dinner for two at Palmer’s Restaurant in San Marcos, gratuity and alcohol not included.
? Fair market value — $850. DRAWING DEADLINE: Monday, 1/14/19 at 9am.
? Dallas Symphony Orchestra Box Seats — Four (4) Loge box seats for the 1812 Overture performance on Friday, April 12, 2019 at 7:30 p.m. at the Meyerson Symphony Center.
? Fair market value — $748. DRAWING DEADLINE: Monday, 1/14/19 at 8pm.
? Snap Judgement VIP Tickets – Four (4) floor tickets to Snap Judgement on Friday, March 29 at the Majestic Theater. Includes VIP Meet & Greet.
? Fair market value — $400. DRAWING DEADLINE: Tuesday, 1/15/19 at 8pm.
? Café Momentum Sunday Supper – 10 winners will be chosen throughout the day to attend Café Momentum’s Sunday Supper Series on Sunday, February 17, 2019. Each winner can bring one guest to the event. Includes food, wine and live music performance.
? Fair market value — $200 each. DRAWING DEADLINE: Wednesday, 1/16/19 at 8pm.
? iPad Pro – Brand new iPad Pro w/ WiFi , 512 GB and sleek 12.9-inch display. Plus, we’ll throw in the Apple Pencil and a Smart keyboard!
? Fair market value — $2000. DRAWING DEADLINE: Friday, 1/18/19 at 8pm.
? Final Drawing – Rick Steves’ 7-day European City Tour — Winner’s choice of trip: London, Paris or Rome! 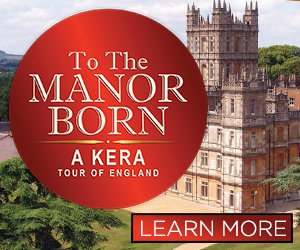 Includes roundtrip airfare for two from DFW Airport, and all activities are provided by Rick Steves’ tour company.
? Becoming a member of KERA FM during our January membership drive automatically puts your name in the hat for that prize and all other subsequent prizes. You can become a member online here, or call 888-694-6931.
? Are you already a member? We’d love for you to play, too. You’re welcome to make an additional donation, which will automatically enter your name into the contest, or you can simply fill out a form to enter. 1. No purchase or other monetary consideration is necessary to enter or to win. A DONATION WILL NOT INCREASE YOUR ODDS OF WINNING. ALL FEDERAL, STATE, LOCAL AND MUNICIPAL LAWS AND REGULATIONS APPLY. VOID WHERE PROHIBITED. SEE RULE 3 TO FIND OUT HOW TO ENTER WITHOUT MAKING A CONTRIBUTION. 2. Subject to the additional restrictions below, the drawings are open to legal residents of the 50 states of the U.S. (including the District of Columbia), who must be 18 or older. Employees and current Board of Directors of KERA/KXT/North Texas Public Broadcasting, Inc., and advertising and promotional agencies, and the immediate family members of, and any persons domiciled with the above, are not eligible to enter or to win. The term “immediate family members” includes spouses, parents, grandparents, siblings, children and grandchildren. 3. How to Enter: One entry per person. Individuals who make a contribution by calling 888-694-6931, or making a contribution online here, during the contest’s drawing windows, will automatically be entered into the drawing(s). Individuals can elect to enter the contest without making a contribution here and completing all of the required information and following all posted instructions. Multiple contributions or entries will not increase one’s odds of winning. 4. Winner Selection, Notification, Odds and Acceptance: One (1) winner will be selected in a random drawing from among all eligible entries received. The winner will be notified at the telephone number or email address provided on the winner’s entry form. Winner’s failure to timely respond to notification, and/or the inability of KERA to reach a winner at the telephone or email address listed on his or her entry form may result in disqualification and selection of a substitute winner. The odds are determined by the number of entries received. 5. Except where prohibited, acceptance of any prize constitutes winner’s consent to the publication of his or her name, biographical information and likeness in any media, including without limitation the Internet, and for any commercial or promotional purpose, without limitation or further compensation. 6. Winner may waive his or her right to receive prizes. Prizes are non-assignable and nontransferable. If the winner is not available to redeem the prize on the dates specified by KERA/KXT, he or she may be disqualified and would forfeit all interest in the prizes and a substitute winner may be selected by KERA/KXT in its sole discretion. If the winner chooses not to accept the prize it may result in the selection of a new winner. No substitutions allowed by Winner. 7. Taxes and Fees: Winner is solely responsible for reporting and payment of any taxes on prizes. Winners are responsible for payment of all tax obligations. All costs and expenses associated with prize acceptance and use not specified herein as being provided such as reservation fees, taxes, insurance and other expenses incurred by accepting the prize are the sole responsibility of the winner. 8. By participating, entrants agree to be bound by these Official Rules and the decisions of KERA/KXT. KERA/KXT reserves the right to disqualify persons found tampering with or otherwise abusing any aspect of this drawing(s) as solely determined by KERA/KXT. In the event the drawing(s) is compromised by a virus, non-authorized human intervention, tampering or other causes beyond the reasonable control of KERA/KXT which corrupts or impairs the administration, security, fairness or proper operation of the drawing(s), KERA/KXT reserves the right in its sole discretion to suspend, modify or terminate the drawing(s). Should the drawing(s) be terminated prior to the stated expiration date, KERA/KXT reserves the right to award prizes based on the entries received before the problem began. 9. The invalidity or unenforceability of any provision of these rules shall not affect the validity or enforceability of any other provision. In the event that any such provision is determined to be invalid or otherwise unenforceable, these rules shall be construed in accordance with their terms as if the invalid or unenforceable provision was not contained therein. 10. KERA/KXT is the sponsor of the all drawings. KERA/KXT reserves the right to change, alter, add or update drawings at any time. The decisions of KERA/KXT regarding the selection of winners and all other aspects of the drawing(s) shall be final and binding in all respects. KERA/KXT will not be responsible for typographical, printing or other inadvertent errors in these Official Rules or in other materials relating to the drawing(s). 11. Prizes Description, Fair Market Value and Entry Deadlines: All entries must be received by the date and time listed to be considered for that drawing. KERA/KXT will not be responsible for incomplete, lost or late entries or for failure to receive entries due to transmission failure or technical failures of any kind, including, without limitation, malfunctioning of any network, hardware or software, whether originating with sender or KERA/KXT. In the event of a dispute, all online entries will be deemed to have been submitted by the owner of the ISP account from which they were sent. For these purposes, an ISP account holder shall mean the natural person assigned to such ISP account by the Internet access provider, online service provider or other organization responsible for assigning ISP addresses for the domain associated with such ISP account. All entries become property of KERA/KXT and none will be returned. Any questions regarding the number of entries submitted or the owner of an ISP account shall be determined by KERA/KXT in its sole discretion, and KERA/KXT reserves the right to disqualify any entries by persons determined to be tampering with or abusing any aspect of the drawing(s).